This set has become my addiction. I wanted to design a retro set for Cubs and White Sox players. With a few successes, this set soon morphed into a monster. I'm trying to collect the signatures of every living Chicago Cub alum, As of August 2011, I'm over 85 returns, all players from the 1940's-1970's. Finally brought one of my white whales home! Danny Murphy in 18 days via his home (K1AO). Great to have one of the oldest living alumni of the Cubs organization come through. I saw he was signing for the first time in forever and whipped up one to send out. 9 days door to door, his daughters kept 2/3 I sent, which is totally cool and returned 1 with a nice note. My second attempt was a keeper for Mr. Mathews. He returned 3/4 customs (K!AO) in 20 days via his home. Even though he played more on the South Side than the North Side, was able to pick up Jim McAnany. He returned 2/4 in 14 days via his home. Tom "Duke" Simpson returned 3/4 in 15 days via his home. He was one of the older Cubs players I needed. Glad to have him home. He also included a nice note. Mr. Warner pitched for the Cubs between 1962 and 1965. Mr. Warner returned 3/4 customs (K1AO) in 13 days. I finally was able to snag the 6X all star. 18 days round trip via his business. Returned 4/4. Pitched for one season with the Cubs in 1955. One of the oldest I had out. Returned 3/4 in 8 days via his home (K1AO). Had seen some successes for Billy Williams coming back from Spring Training and had to take a shot. Mr. Williams graciously signed 2/2 customs and returned them in 22 days. Incredible return from a short time Cub. 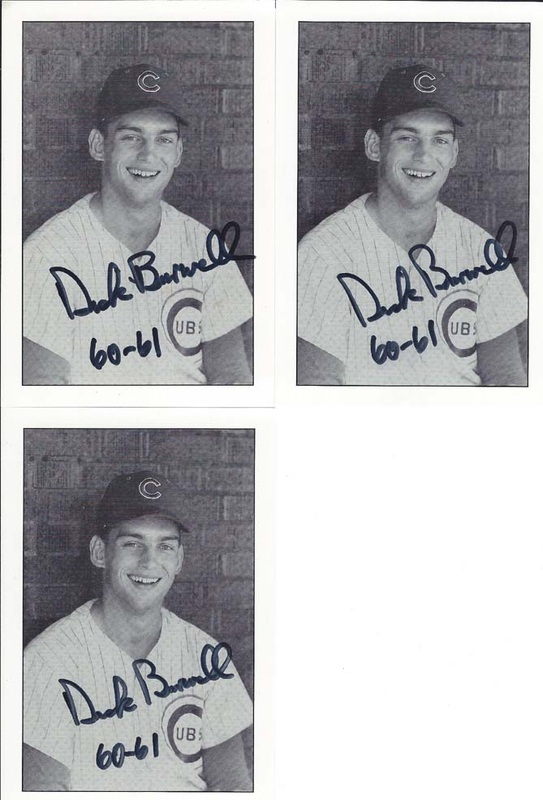 Mr. Burwell played in 5 games for the Cubs in 60-61. He returned 3/3 customs, included three 4x6 cards and wrote a great note. One of my longer stories for a return. I sent Mr. Balsamo four customs in the fall of 2011. He returned 3 of them... signed on the back. He also requested a dozen from me. I sent him 16 more, requesting a signature on the front of the card and he complied and sent a nice note. Good to have him off the list! Former Cubs Hurler Morrie Steevens returned 4/4, plus a little note in 9 days via his home. Well, it's a goofy success, but a success nonetheless. The former pitcher signed the backs of 3/4 customs (K1AO). He also requested a dozen more... I'll send em, as long as he signs the front, LOL! Got this return back from Jack Spring, took 31 days, he returned 3/4 customs (K1AO). This is my 100th return from my Cubs Retro set! Mr. Clemens played outfield for the Cubs in 1964-65, and also played for the Phillies and Cardinals. He returned 3/4 customs in 8 days via his home. Mr. Dowling returned 4/4 customs in 15 days via his home. Mr. Dowling pitched one game for the Cubs in 1966, going all 9 innings and getting the win while striking out 3 and walking none. Cubs first baseman returned 3/4 customs, all personalized, in 8 days via his home. Kept 1 as offered. Wow. This one took 246 days to come home, but am so happy to have it. Mr. Dave Hillman returned 3/4 customs (K1AO). Signed nicely. I sent a $5 donation. 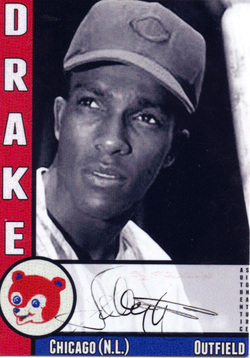 Former Cubs Shortstop had a little cup of coffee in the show during the 1962 season, appearing in 9 games. He returned 3/4 customs (K1AO) in 10 days via his home. Returned 3/4 (K1AO) in 14 days via his home. This was a longshot. the last success I had seen was 2005. Former Utility Man returned 2/4 customs in 11 days via his home. Cubs outfielder returned 3/4 customs (K1AO) in 7 days. Great return... I love this card. Former Cub catcher returned 3/4 in 7 days (K1AO). Former Cubs pitcher returned 3/4 (K1AO) in 14 days via his home. Mr. Mudrock pitched in one game for the Cubs in 1963. His only appearance in the majors. He returned 2/3 (K1AO) in 9 days. Former first sacker and manager returned 3/4 (K1AO) in 9 days via his home. This was my 2nd request to Mr. Henry. This time I sent a $10 donation and he returned 4/4 customs in 9 days. 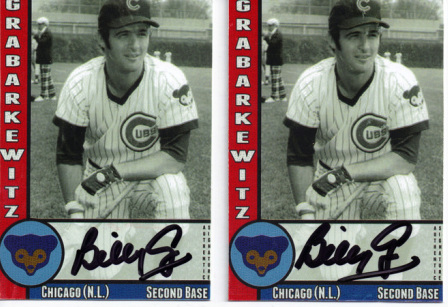 Former Cubbie Outfielder returned 4/4 customs in 21 days via his home. One of the most reliable signers in the hobby today! Mr. Shantz returned 3/4 customs (K1AO) in 9 days via his home. 210 Days. 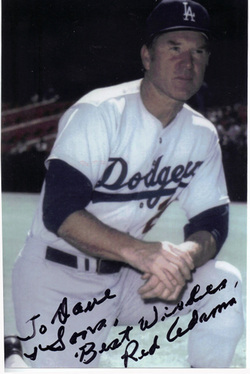 Mr. Adams signed all four cards for me, plus sent a 4X6 from his time with the Dodgers, and a great letter. He played eight games for the Cubs in 1946. Mr. Schaffernoth came through in 13 days. Kept 1 as offered, returned 3/4. Another short time Cub, but he came through. Returned 3/4 customs (K1AO) and personalized them to me and my kids. Took 32 days door to door. Sooo stoked about this one. I sent to Rev. Drake in January. I had seen many reports that he did not sign at all, but took a shot and sent a $20 to his church. Received 1/4 customs back signed (also returned 1 unsigned) and returned my $20 donation. This was one I thought wouldn't happen, but I am very happy to have it home! Former First Sacker, Paul Smith returned 3/4 customs (K1AO) in 10 days via his home. Again, another one year player for the Cubs, but an auto I have been trying to get for quite sometime. Glad I was able to get him! He returned 4/4 in 10 days via his home. Returned 3/4 customs in 7 days. Also placed a piece of cardboard in the envelope to protect the cards. Cool return. Former Cub Hurler returned 3/4 customs, K1AO, in 9 days. Personalized them to me and my kids. Mr. Warwick returned 3/4 (K1AO) in 10 days. I typo'd this, placing him as a pitcher, which he pointed out was incorr4ect. He also said he doesn't sign customs, but personalized all of them to me. Former hurler returned 3/4 (K1AO) in 8 days via his home. One of the best friends to the autograph hobby... Mr. Schult signed 3/4 (K1AO) in 6 days via his home. Another one year wonder for the Cubs. After a successful career as a Yankee, Mr. Silvera finished up in Chi-town. He returned 3/4 customs (K1AO) in 25 days via his home. Popeye signed 3/4 customs (K1AO) via his home in 12 days. Don't know if his wife ghosted them on not, but still a nice looking sig. 9 days on the return via his home. Kept 1 as offered, returned 3/4 customs. Former Outfielder returned 3/4 (K1AO) in 9 days via his home. Former Cubs catcher returned 3/4 (K1AO) in 8 days via his home. 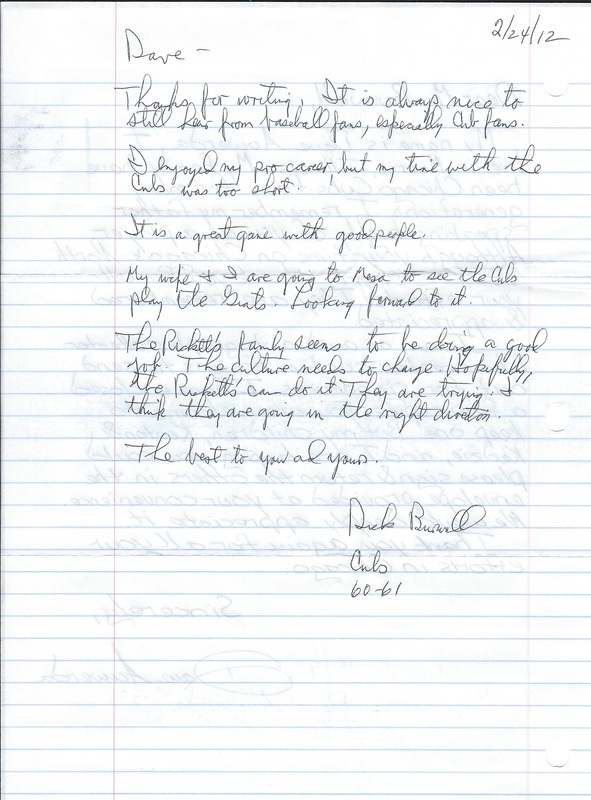 He also included a nice letter, although someone else wrote it and he signed it, and signed the envelope. Cool return. Another short time Cub, but had a great career, mostly with the Reds. Mr. Hatton returned 4/4 customs in 8 days. It took 2 attempts, but I finally scored Bob Anderson. He returned 3/4 customs (K1AO) and included a form letter, which he then signed at the bottom. Great success. Another short time Cub for the collection. Mr. Massa returned 3/4 (K1AO) in 9 days via his home. Quick return on this one. 7 days via his home. Returned 3/4 (K1AO). Played one year with the Cubs. Returned 3/4 customs (kept1 one as offered) in 14 days via his home. I sent $20 donation. 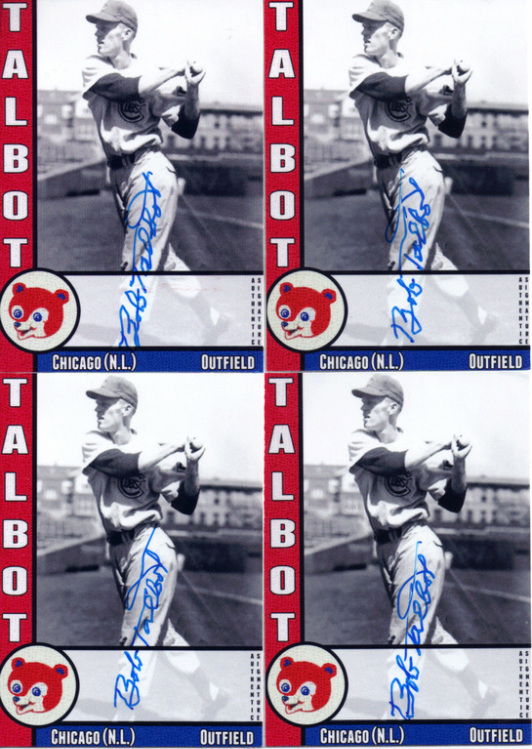 Former Cubs infielder signed 3/4 customs, kept one as offered in 12 days via his home. Mr. Mayer pitched for the Cubs in 1957 & 1958. Although his career was short, he was very gracious with his return to me. He returned 3/4 customs (kept 1 as offered, then included 3 copies of a Topps Heritage Card and also wrote a nice note. Pretty cool story for Mr. Phillips. I sent him a set to sign, only to have him return them because I had labeled him as an outfielder rather than a pitcher. He asked me to fix the error and send back, so I did. He then returned three of those customs (and kept 1 as offered) but also attached the following note. Needless to say, I'm humbled. I will be putting a batch together for him soon! 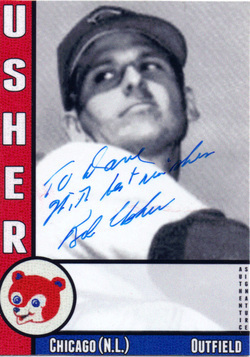 Mr. Gabler's professional career consists of three pinch hit appearances for the 1958 Cubs. Still awesome to get his sig. Super fast, he returned 3/4 customs (kept 1 as offered) in 6 days via his home. This outfielder broke in with the Cubs in 1957. Only spent one year with them, but I'm glad to add him to the list. This one took 71 days to come back, but well worth the wait. Former Cubs third baseman had a quick release on this one... 8 days door to door, returned 3/4 customs via his home, kept 1 as offered. Although he only played one year on the North side, he had a heck of a career. Returned 3/4 customs in 6 days via his home. Also wrote a nice note on my LOR. I sent a $20 donation. My second King in the Cub Collection. He returned 3/4, kept one as offered in 8 days via his home. 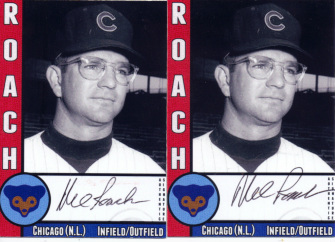 This former outfielder played in a couple different seasons for the Cubs. He returned 3/4 (kept 1 as offered) in about 12 days. Mr. Goryl is my 51st return from this set. He returned 3/4 customs (kept 1 as offered) in 6 days via his home address. Now this is a great return! Mr. Will returned 3/4 customs (kept 1 as offered) in 6 days, and included his own 5X7 picture and a 3 page note in return. Mr. Will is not in good health, but truly a class act with the autograph community. I did include a $20 donation. He also asked me to send a few additional copies of my card for his grandchildren which I will gladly make up for him. Cool return from Mr. Ed Mickelson. He kept 1 as offered, but signed & personalized 3/4 back to me and my kids. Took 7 days round trip. Mr Fanning returned 4/4 customs in 24 days via his home. He replaced 1 of the 4 with his own card and wrote a great letter. 25 day turnaround from this former Cub. He returned 3/4 (kept 1 as offered) and included the years he played. Mr. Larsen returned 4/4 in 10 days via his home. I included $20 donation. Mr. Valentinetti signed 3/4 customs (kept 1 as offered) via his home in 9 days. Also asked me to send a few more to him, which I will do shortly! Mr. Lown signed 3/4 customs (kept 1 as offered) in 14 days via his home. I included a$20 donation. Returned 3/4 customs (kept 1 as offered) in 9 days via his home. Great return from this Ole Cub. Included the years he played and personalized them to me and my kids. Returned 2/4, but that's fine. Great return, in my mind. Took me awhile to find a good pick of Mr. Zick (Thanks RockiesFan33!) Returned 3/4, kept 1 as offered. Mr. Speake returned 3/4 customs (kept 1 as offered) in 9 days via his home. One of the "one game wonder" stories throughout baseball. 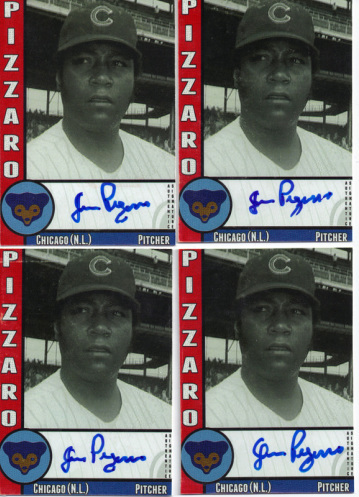 Mr. Pyecha pitched in one game for the Cubs in 1954 and never made the show again. He graciously signed 4/4 customs via his home in 9 days. This former high school phenom and Cubs pitcher returned 3/4 customs (kept 1 as offered) in 9 days via his home. Eleven day turn around for this former Cubs hurler. Returned 3/4, kept 1 as offered. Mr. McDaniel signed 3/4 customs (kept 1 as offered) and sent a signed stat card in 13 days via his home. He was one of the best closers of his generation. Returned 3/4 customs in 68 days via his home, plus thanked me on my LOR. Mr. Usher returned 1/5 in 12 days via his home. He also signed my note saying he only signs/personalizes one so they aren't sold or traded. Happy to have one! Mr. Talbot returned 4/4 customs in 8 days via his home. Mr. Schramka returned 3/4 customs in 8 days via his home as well. He also included a signed copy of a Sun Times article. First time I sent to Dr. Nye, it came back as a RTS. Tried again via his home and success! Took 47 days, but Dr. Nye returned 3/4 customs (kept 1 as offered). Glad to see this one come back through. I sent Mr. Manville a few customs late last year, but my SASE was soaked and the cards were destroyed. So, I resent 4 more to him and he returned 3/4 of those in 28 days via his home. Another great Old School return. Jim Bolger returned 4/4 customs in nine days via his home. I've been waiting patiently for this one. Received 3/4 customs back from the 2 time all star, he kept one as offered. Return took 17 days. Thank you, Mr. Jackson! 11 days on this return from Mr. Borkowski via his home. Returned 3/4, kept 1 as offered. Very nice signature. Mr. Kelly returned 3/4 customs (kept 1 as offered) via his home. Love the way this card turned out! Mr. Terwilliger was fast! Returned 3/4 customs (kept 1 as offered) and sent his own St. Paul Saints card in 7 days via his home. I also sent $20 donation. Hey, what's a good retro set without an error card! Still great to get Mr. Pizarro's autograph. Took 11 days round trip from Puerto Rico! One of the oldest surviving Cubs players (with Cliff Chambers, Bob Rush, Andy Pafko, and Red Adams) He still has a great signature and returned 4/4 in 7 days from his home in Wisconsin! 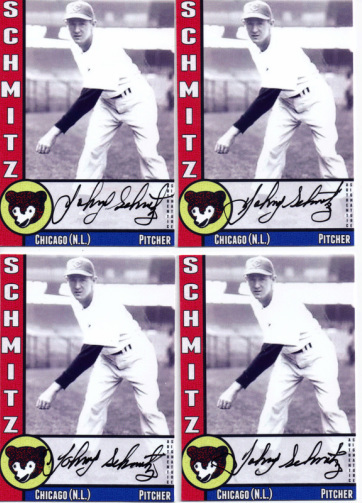 This former Cub, who threw a no hitter for the Pirates in 1941, returned 3/4 (kept 1 as offered) in 11 days via his home. I've wanted this one for awhile. "Fuzz" Richards played in 10 games for the Cubs in 1951. He signed and returned 3/4 customs in 5 days via his home. He kept one as offered. One card got stuck to the back of the glue on the envelope and was damaged, but still happy to have this return. Billy G signed 2/4 customs (Offered 1, kept 2) in 9 days via his home. I sent a $10 donation with the request. Quick turnaround for Mr. Stewart... a week door to door. He didn't sign in the autograph box and even switched pens in the middle of one signature, but I'm happy with the return anyway. Took me two tries for Mr. Aker. I sent to him late in 2010, but was unaware that he charged $5 per card and he returned the cards to me unsigned. I resent to him again with $20 and received all four cards signed in 4 days via his home. Mr. Spangler returned 4/4 customs in 7 days via his home. Mr. Beckert signed 4/4 customs in 9 days via his home.